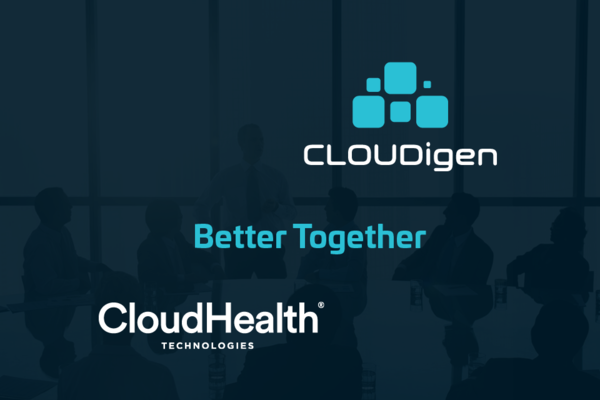 CLOUDigen, Inc. today announced a partnership with CloudHealth Technologies, a leading cloud service management provider. PORTLAND, OR, August 31, 2017 /24-7PressRelease/ — CLOUDigen, Inc. today announced a partnership with CloudHealth Technologies, a leading cloud service management provider. The partnership will enable mutual clients to grow their businesses more effectively leveraging the Amazon Web Services cloud. CLOUDigen’s mission is to help clients get the most out of cloud so they can focus on growing their business. In support of this mission, CLOUDigen will combine its extensive experience delivering cloud-based services and technical consulting with the power of the CloudHealth platform to deliver deep insights into cloud usage, cost and security. Clients can take advantage of our tiered managed cloud service offerings, including customized reporting by functional business group, infrastructure rightsizing, unused infrastructure management, policy-driven cloud security best practices, reservation management, and best practices for optimization, governance, and automation. Fully managed tiers include aggregated cloud billing, proactive automation, configuration remediation and periodic business alignment reviews with a dedicated virtual Chief Cloud Officer “vCCO”. “Our clients expect us to deeply understand everything that’s going on in their cloud and ensure continual alignment with their business. CloudHealth Technologies gives us the means to do that,” said Rob Bush, CEO, CLOUDigen. To learn more about CLOUDigen, visit us at www.CLOUDigen.com or follow us @CLOUDigen. Robert Bush, CEO and R. Ryan Kidney, CTO Founded CLOUDigen March 2016 with goal of providing premium managed services for clients running apps in the public and hybrid cloud. Having witnessed the growing impact cloud computing has had on the IT industry and the increasing gap in capability of traditional MSPs attempting to adapt, Robert and Ryan architected CLOUDigen to specialize in solving the needs of cloud adopters. CLOUDigen Inc. is self-funded with headquarters in Portland, OR and remote offices in Denver, CO.
CloudHealth, the recognized worldwide leader in the growing Cloud Service Management industry, provides integrated reporting, recommendations and active policy management to help companies control the problems associated with “cloud chaos.” Our comprehensive platform gives enterprise companies and MSPs the ability to visualize, optimize and govern their cloud and hybrid environments. By providing analysis and deep insight into historical trends, capacity planning, resource optimization and resource automation, CloudHealth enables stakeholders ranging from C-level executives to engineers, cloud specialists, architects, IT directors and LOB managers to improve performance and drive value through their cloud ecosystems. Based in Boston, the company is backed by Kleiner Perkins, Meritech Capital Partners, Sapphire Ventures, Scale Venture Partners, .406 Ventures and Sigma Prime Ventures. For continuous product updates, industry news and engagement visit us at www.cloudhealthtech.com or follow us @cloudhealthtech.